Air-conditioned classrooms are spacious and well-ventilated equipped with White boards and Audio-Visual & LCD projection to facilitate The learning process. School ICT lab is equipped with 25 Multimedia based Dual Core HP-Compaq machines with Internet facilities for students. We have 1 computer for one student. Computer Lab is also equipped with English language lab software and hardware to make it a dual purpose lab. Mathematics Lab: The Mathematics Laboratory is a Experimental & Logical thinking playground for young scholars. 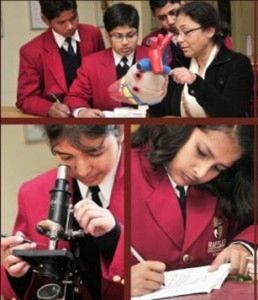 Students from classes III to X have well planned activities here.To facilitate and engage the students in a variety of hands on learning experiences the students and teachers have put together models and gadgets in the laboratory. There are a number of experiments with colorful paper cutouts & paper folding activities which help to clarify simple concepts of lines; points angles and triangles to class VI as well as complex theorems to class X. Well equipped library with wide range of reference books, magazines, periodicals Audio –Visual aids, computers aided reference and provision of Internet at library gives students an access to e-Learning and international libraries to enhance their knowledge. Oyster School give Performing Arts a special place at curriculum and co-curricular arena. Performing Arts provide student self-expression and interpersonal skills. At Oyster students learn variety of Indian and western instruments. Every student finds expression to his or her rhythm and thereafter, hones these talents from contemporary to classical. Art opens new vistas of life. It creates a new land of colors, fantasy and imagination. Art & craft gives children an opportunity to envision a land where dreams become reality and imagination becomes colors. At Oyster , we educate young minds in art & craft to create, mould, chisel and shape a world of their own….. Swimming takes a special position at Oyster. This is one of the most favorite activities of the students. The water is hygienic – chlorine free and treated with ozone technology. The expert coaches recruited here are responsible for the safety and training of the students. We also aim at training the students for various competitions.